Looks good as accent beneath another colorful area rug. 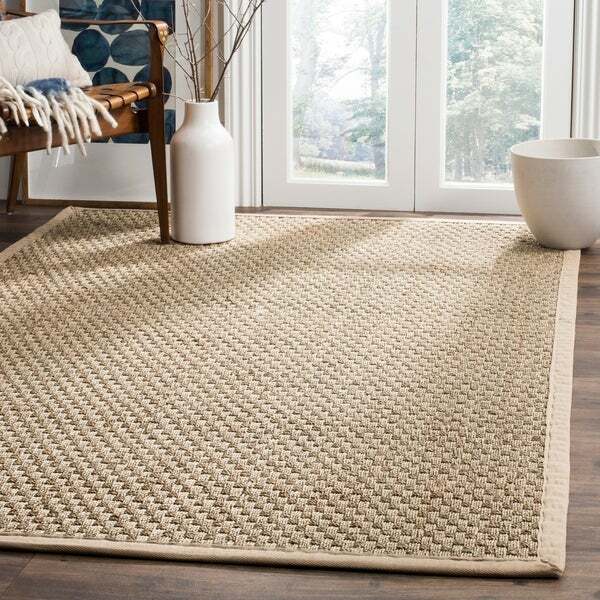 Turn any living space into a stylish beach home with the organic beauty of this 9' x 12' seagrass rug from Safavieh's Natural Fiber Collection. Bordered in beige cotton twill, this rug's clean, neutral pigments and elegant basketweave design allow for unlimited decorating versatility. I bought this rug to replace a natural sisal rug in my living room that was nice in appearance, but scratchy underfoot and didn't hold up to my pets occasional accidents. This rug is thick with a nice tight weave. The color is a light brown with greenish undertones that looks very nice. It is a natural fiber rug so expect that it is not the sort of rug that you would sit on and be comfortable. The texture feels smooth but bumpy underfoot, and I like this-walking barefoot on it is like a mini massage for my feet. Although quality and appearance are important, the real test is being able to clean accidents that occur from my dogs. There have been a couple mishaps, but the rug cleaned without a trace by using my portable rug cleaner ( yes, I was able to use water) and drying the spot with a fan. I have had sisal and jute rugs in the past and they always showed the area that was spot cleaned and I ended up tossing them after a time. I chose the sea grass for the first time because it is from the sea and logic told me it should hold up to exposure to water when needed, and it does. I bought the 9x12 size, and was delighted with the purchase. It has a cotton backing, so I do recommend a rug pad so it doesn't slip. Also, I got the light cotton border, so we sprayed Scotchguard on that to protect it from dirt. I have two crazy active big dogs, and the seagrass rug is in the main living space. It is sturdy and indestructable, I highly recommend it! One other comment -- If you walk around barefoot, it is not that comfortable for bare feet. It's not intolerable, just rough. I bought a cowhide in a honey shade to compliment it, and placed that in the main walking areas. It bumped the whole thing up a notch, the cowhide on top of the seagrass. Other smaller rugs on top of the seagrasas will look very elegant too. Looks good, but It Hurts! I bought this rug because it was canvas backed. I love the look of seagrass, but was told that the latex backing on most seagrass rugs will damage hardwood floors. Apparently latex reacts with the finish of the floor over time and causes the latex to stick to the floor. In many cases the floor has to be professionally refinished to remove latex. This rug is, in fact, cotton canvas backed. I really like the look. There is a slight smell, which doesn't bother me, like hay, which I suspect will dissipate over time (I just got it yesterday). It is a very coarse weave. The workmanship is good. But it hurts really badly to walk on it with bare feet. My feet are raw today from just walking over it a few times. Hopefully it will soften up a bit. But I love the look! It is worth the money. This is an incredible value for the money - the rug is great quality, well made (edging is even and tightly sewn) great color, wears well, doesn't shed. I could not be happier with this purchase!! I flip houses for a living and bought this to stage a new expensive home - it looks clean and crisp and sturdy, the nice neutral color is the perfect backdrop for other furniture and accessories to pop. I was concerned it would be green as others reviewed and rolled up it did have a green hue. However, it was very minor and fades because this is seagrass. I ordered in 3 sizes to accommodate an open floor plan and help it flow. 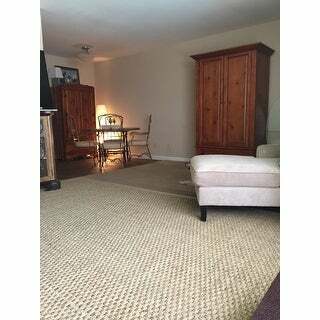 Wish we could add pictures, all three rooms are different in their own way but beautiful with this rug because it goes with any decor. 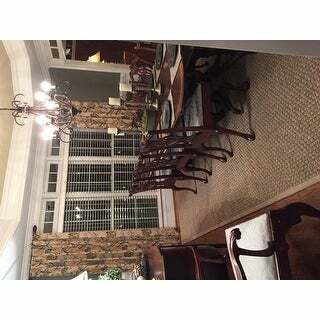 The weave is tight enough that dining chairs easily slide in and out without damaging the weave. The border is light and although it seemed to get dirty fast I found that wiping with a dry cloth knocked off most of the dirt. We do have a dog and had a party after adding the rugs...they still look great. In two rooms I added smaller rugs (5x8 over 9x12) to layer over these to add dimension and texture. Definitely recommend this rug!! I also liked the subtle chevron pattern but it wasn't available in all sizes I needed. I saw one in person and it subtle enough that it will bear the test of time. Our local carpet store custom makes these and it would have been $400 more had I gone through them. Using my O Rewards, taking advantage of an Overstock sale weekend I really saved. I also called Overstock since it was my birthday month and although they don't have a birthday promo program he offered 10% off which was nice but less than the 12% they already had going. Customer service also helped me find a bulk purchase coupon. Gotta love Overstock!! Another great Safavieh rug! Can’t beat the price for a sea grass rug. Great neutral color so the rest of the room can be decorated in any color. 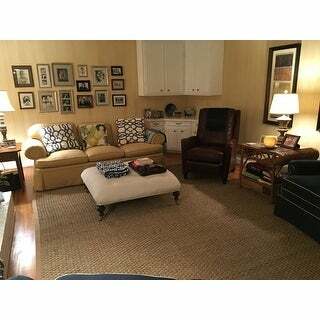 This rug is perfect in my space, the living room! I have owned 4 Safavieh natural fiber rugs and they are all wonderful. They take a beating and make a space look up to date. No more wool rugs for me. Good rug for casual look! I do like this rug (seagrass) for the casual look and easy to maintain material. Savavish is a reliable brand and the price was good. 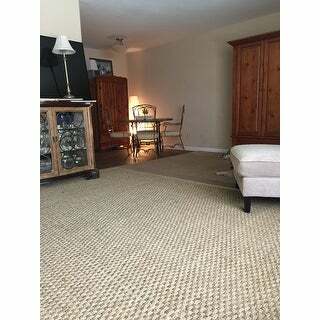 The basket weave pattern is a little rougher than my previous seagrass rug that was a tighter, more even weave so look closely at the photos. The rug arrived promptly with no problems. I ordered a rug pad too so the rug feels a little softer and hardwoods are protected. Beautiful rug, but poor quality. This rug is beautiful! I was thrilled when it arrived. However, after only having the rug for a bit over a week, several places in the weave became unraveled. This rug is not in a high traffic area and I did not vacuum the rug. Very disappointed! 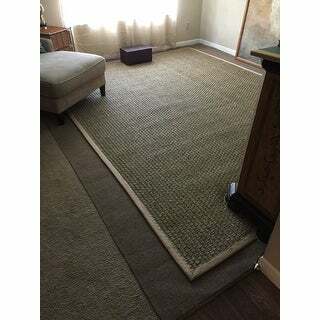 Overstock offered to send a replacement, but I declined because was afraid the same issue would happen with the new rug. Beautiful rug, but BEWARE: It's NOT 9' X 12", it is 6 inches less each way. Made a big difference to us. Love this rug and the look. You may not want to walk barefoot on it. I've had this for many months and I absolutely love it! It took a couple weeks to lay flat and it was a beast to lay down a 9x12 rug in my bedroom with the furniture already in place, but it looks wonderful! My kids think the texture is too harsh but I love the way it feels on my feet. The cloth around the edges is starting show dirt, so I have to figure out how to clean it. But I'm thrilled with this purchase -- it looks very high end. A little hard to walk on with no shoes. Probably will put it on my patio. Nothing wrong with the rug. The rug is as neatly woven and in tact as it was the day we bought it, a couple of years ago. Nearly everyone who sees the tug has very nice and positive things to say about it. The rug itself, is heavily constructed with a firm backing material and a sewn, 2” fabric border. Cleaning the rug is not. A difficult task either. I wouldn’t recommend running a “grinder” or older beater-bar vacuum across it, but you can vacuum the rug by employing simple care. The photo on the website does not do this rug justice. It is quite beautiful with the weave detail. Perfect touch to my farmhouse decor that include many wood elements. We love our new rug. It has transitioned our side porch into a new room addition! This rug is exactly what I expected ... it does not shed or smell. It looks great in my bedroom although it’s a little hard to walk on. I think I’m gonna learn to love it if it holds up as well as I think. I would highly recommend it to my friends. Great buy!!! I would recommend this rug to friends. Nice heavyweight & really brightened up my space giving it a nice crisp look for spring. 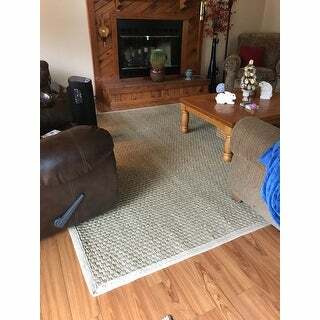 Other reviews stated the rug had an odor but I did NOT have as issue with Oder from the rug. I’m liking this rug but it probably won’t last too awful long. It’s in our living area and the weave is loosening. I got what I paid for. Probably shouldn’t expect more. This rug is exactly what I was looking for visually and looks great in my living room. The quality is really nice. I like the seagrass feel on my feet so that isn't a problem. I have had it for a few months though and it still smells like a barn when I walk into my apartment. It's definitely fading, but slowly, so if that is going to bother you don't get this one. "I am looking for this type of rug for out doors. covered deck that gets a lot of water in the spring and fall? can it be used outdoors for this? If not can you recommended. I need two really quick." Due to the material, this rug is not intended for outdoor use. "What sizes does this rug come in"
"I am looking for 2 of the same seagrass rugs, one 9 X 12 and one 10 X 14 with beige border." "Is this rug all seagrass, or is part of it sisal? The description says seagrass, but then it says sisal weave.... I don't want sisal due to easier staining." The rug is made of seagrass, sisal weave describes the way in which the rug is woven together. "Does this come in at 10 x 14 also. I need a 9 x 12 and a 10 x 14"
"What is the best way to get dog urine out of this rug? I have cleaned it with vinegar and baking soda as I have done with other rugs but the rug has changed to a darker color where the spot was cleaned. Any suggestions?" We actually used a carpet cleaner that works with warm water and cleaner for pet stains. We only used it in that particular area as the machine doesn't completely get all of the solution back out of the rug. We then propped it up until it dried. It works best if you clean it quickly after the accident. Once the urine dries it doesn't work as well. I’ve had my rug for years with 2 dogs. I simply spray an accident with Clorox Cleanup and when dry there’s no stain, no smell. Best rug ever for pets! "Is the rug backed with cotton or latex?" This rug has a felt backing.